• Writers write: Get my soap box ready, here I go. Tuesday night, around ten p.m., I needed milk for breakfast. I drove to Sobey’s on south Albert. A fellow drove into the parking lot at the same time. He parked his car in a handicap zone and walks into the store. He didn’t miss the handicap parking sign, I am certain of that. He decided that he would use it, as no one else was at the time, as if that was his right. Being a good Canadian, I was indignant. Canadians believe that handicap parking spots are for those who truly need them and that it is not a hardship to walk a few extra feet. In fact, being able to walk those extra feet is truly a privilege. That sense of moral indignation, which appears to be a part of our national fibre, was fuming inside of me. Do I say something? Do I ask him why he thinks he needs to park in a zone that is reserved for others? Do I risk a confrontation because Canadians might have moral indignation, but unlike our American cousins, we detest confrontation. So, as most of us do, I said nothing and just fumed for an hour or two. Now I complain to you about what happened. That is also a Canadian trait. I often wonder, if all of us, collectively as a nation, started bawling out people who usurped handicap parking zones, would it not bring an end to the behaviour quite quickly? Social shaming does work and most of us are not prepared to be confronted because we snuck into a parking zone that did not apply to us. I do wonder. • Readers write: I want to thank the many of you who wrote in just to say “welcome back”. Those readers include Margo Soriano, Jay Hale, Doug Gummeson, Sandra Rayson, Tim Mooney, Denise Mirva, Shannon Claypool, Ken Alexe, Roberta Nichol, Ingrid Thiessen, Lyn Goldman, Jean McKay, Janice Cerato, Ricky and Judy Kerr, Patrick Hawley, Wilma Bell Wessel, Denise Cook, Casey Van Vloten, Audrey Henderson, Linda Lyster, Adella Hayko, Sally Orr, Rex Deverell, Georgia Hearn, Michelle Jackson, Arlene Sauer, Frank Flegel, Kathleen Livingston, Donna Burton and Gail Bowen. I don’t want to do a ‘Sally Field speech’ but you really do love me! The tulips I planted last October are now in bloom! 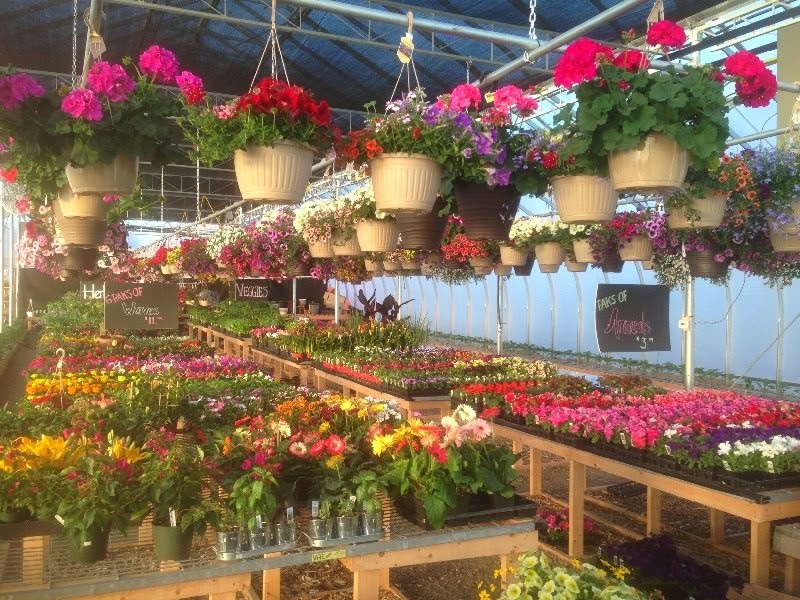 • Photos credits: The hanging baskets are being grown at Cedar Creek Gardens, across the street from the old Cinema Six. Also, Brad Crassweller and his family grew their own perennials, for resale purposes, and in this photo, you can see the plants turned out quite lovely. The key to growing good perennials is to grow them slowly, with the temperature around ten degrees, in April. If you grow plants at a higher temperature, they tend to become leggy. My adage for growing plants is quite simple: Develop the roots and the tops will follow. The photo of the Martagon Lily is from my garden. This lily grows well in the shade. I have had it for close to ten years and last fall, I divided it up into four parts and replanted those parts throughout my garden. All four parts are up and will bloom later this season. 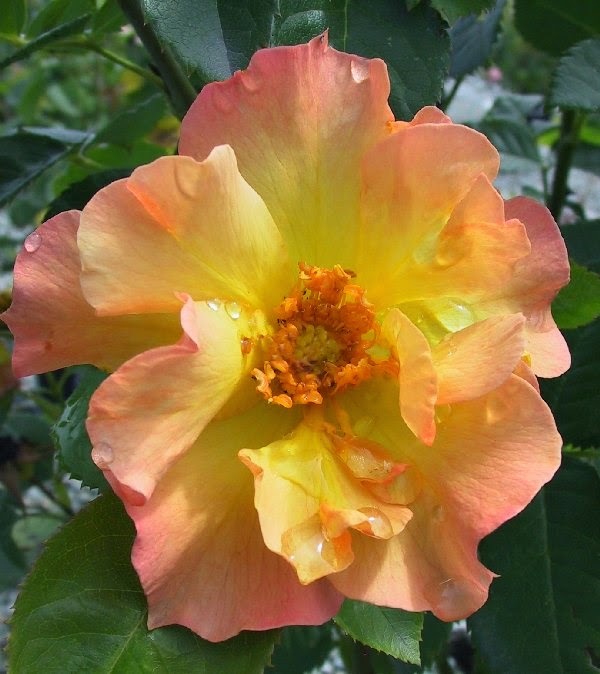 The ‘Morden Sunrise’ rose is also from my garden. It suffered considerable winter damage this year but it will bounce back. I expect full blooms, like this one, by the end of June or early July. 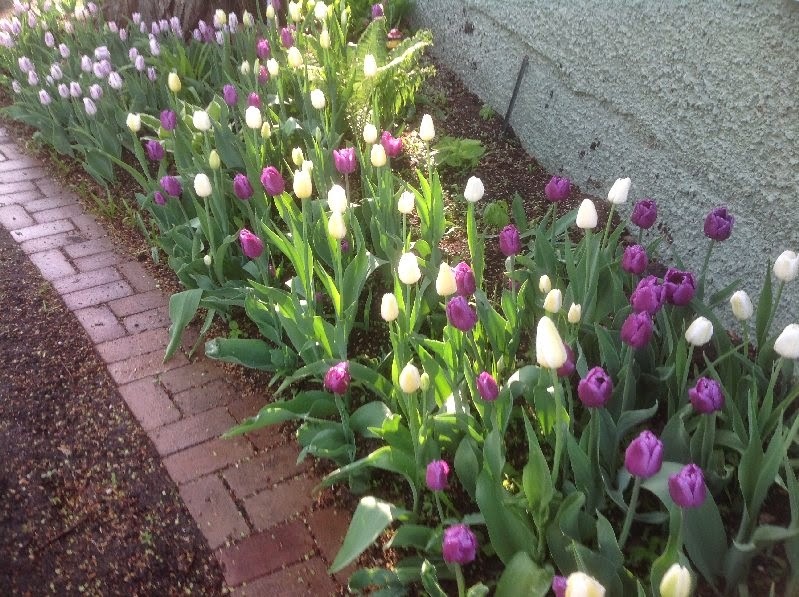 The last photo shows a handful of the many tulips I planted last fall. I do love my tulips. 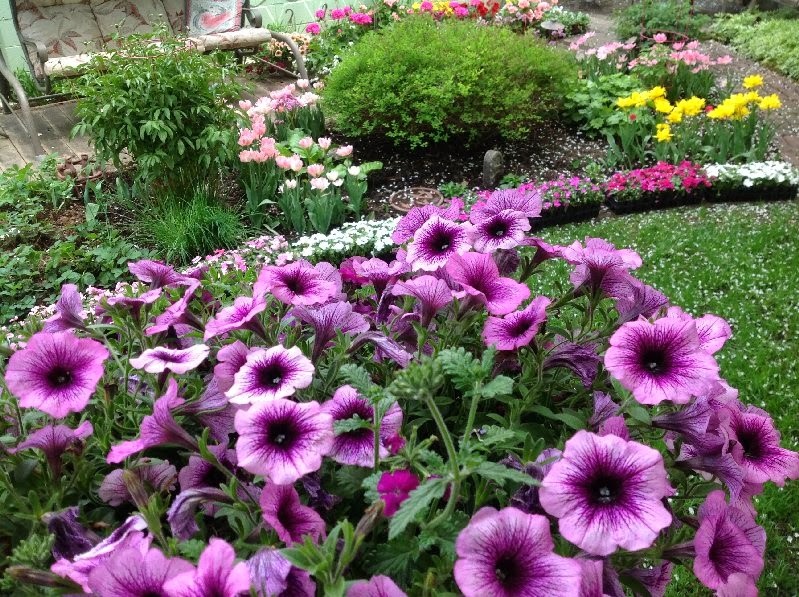 • Garden Tip: For your trees, shrubs, perennials, roses and bedding plants, I recommend one fertilizer. One fertilizer only, as I like to keep life simple. The one I use and therefore recommend is a water soluble 10 30 20. Now, since I sold Lakeview Gardens, I realize that it can be difficult to find one with those numbers. I actually bring in large bags of it from HJS out of Winnipeg for my own use. If you cannot find my recommend, a good sub would be 15 30 15 which I have seen available in several stores and garden centers. Remember that the regular application of the fertilizer is more important than the actual NPK numbers. • On the search for good food: Here are a few Oriental places that we have checked out this past winter. Pearl River is a hole in the wall, grab joint in The Hill Avenue Strip Mall. It has been there for many years and is close to our residence. It produces a top notch wonton soup and an excellent hot and sour soup. The chicken or beef satays were not worth ordering again nor was the chicken with baby corn. Surprisingly, the old standby, chop suey, is done very well, so don’t turn up your nose at this fifties dish. Ngoc Anh, which is in the space where Mieka’s used to be, Smith Street near 11th Avenue, is in a word, unpredictable. This place is run by a lovely family and I would have thought as it is the same people cooking each night, that the dishes would not vary. Not true. We have eaten there a total of six times. Three times, the food was first rate and three times our reaction was “what the hell is this?” One night, we ordered a bowl of hot and sour soup, a favourite of ours. It had been an excellent soup the last time we ordered but this time it tasted very similar to a sweet and sour sauce. Yep, the soup was very sweet indeed. Strange. One night we enjoyed a fabulous dish called mango chicken and the same dish, on another night, was very short of chicken. Had they run out and were reluctant to tell us? If we only knew the nights when they were going to be bang on in the kitchen, we would attend on those nights. The Nhu y Tea Tree was our choice for New Year’s Eve and thank God the year has been much better than the meal. Most places that advertise they are Viet/Chinese/Thai places are usually owned by Vietnamese. We started out our meal with one of their pho bowls and it had an odd taste. I can’t explain it other than to say it did not taste great. That was our Viet choice. Then we ordered a Chinese vegetable dish and one labelled as being Thai. Both looked identical. Could not tell one from the other except the Thai one had a tablespoon of green curry paste mixed into the veggies. Thai cooking is one of the most sensuous cuisines anyone can eat and rest assured, a bit of green curry paste does not make any dish Thai. All three dishes fell short and the only saving grace was I did enjoy a Vietnamese iced coffee. That was the highlight and nothing more. Obviously, not getting a recommend here. Ngic Van serves up a decent, large bowl of wor wonton soup for $14. Two small complaints. The wontons are the smallest I have seen and the chicken broth was not skimmed of its fat which meant there was a presence of oil (chicken fat) floating. When I make my chicken broth, I let it cool over night and then I remove the fat that accumulates at the top. I love a clear, well flavoured broth and I know when one is not made properly. After the soup, we each ordered a barbecue pork steam bun, one of my favourites, anywhere I go. Maureen loved hers and mine was not eaten. Why the difference? Their steam buns are wonderful except they bake an egg inside, on top of the filling. Maureen loves a baked egg, even as a surprise. I don’t like eggs, surprise or no surprise. I asked the owner if he ever makes them without eggs and he told me to call him two days in advance and he would make a batch, just for me, without eggs. Nice fellow but it’s not going to happen. The Sezchaun Kitchen is in Saskatoon on Broadway, near Ninth Street. If you can find The Seven Eleven, you can find this place. We spent quite a bit of our time in Saskatoon, last summer and fall. Before that, when we travelled with The Fringe, performers would always order the braised tofu and vegetable dish from this place. I know, I know, it doesn’t sound all that delicious but trust me on this one, ignore the name and you will enjoy the dish. Back to the soup in question. We love our soups, any kind, anywhere. We had the best wor wonton we have had in this province, at this joint. The price was ten bucks and I asked our waitress what was the difference between the deluxe wonton and the wor wonton? “The deluxe is a smaller bowl.” With that question resolved, we dug into a large bowl of soup, the broth was excellent, lots of wontons, shrimp, chicken, veggies and the requisite barbecue pork floating across the top. I don’t have an overall recommendation for this place, having only ever sampled three of their dishes, but I will stake my reputation (good or bad and no snarky comments, please) that this wonton soup was a highlight of one of our many trips. • Garden Tip: After reading all of those reviews of low calorie places to eat, best if all of us return to the garden to burn off those calories. Gardening is one of the best forms of exercise that any of us can engage in. Gardening sustains life and more importantly, it makes life worth living. So, this was not really a classic garden tip, more of an admonition to get out there and grow something. • Tulip time: Last fall, Billy Patterson came over to help me plant my tulips. We planted either 1200 or 1500 bulbs, I can’t remember, October was a long time ago. The fruit of our labours has come to fruition and the hidden treasures are now poking their noses through the soil. Again and again I preach but does anyone listen? Tulip bulbs, planted in the fall, give you a full four to six weeks of colour before you can set your annuals out (this year being the exception). I love my tulips so much that I think there must be a Dutchman in my family tree. I apologise to The Dutch Embassy, in case they read this epistle, what with The Dutch Embassy having a limited sense of humour. That comment should get a few nasty letters from the Van Noorts, the Vanderveens, the Van Zantens and the De Jongs, all of whom are readers. • What I do for my readers: In February, I had a GIC mature. I took some of that money and bought shares in The Dairy Queen. Now, every time we go to the DQ, it is not for a treat. Rather, it is nothing more than a shareholder inspecting a Blizzard, for quality control. If you need a further explanation, look up the word rationalization in the dictionary. • Vole damage: If your garden suffered vole damage, here are some things you can do. Shrubs that have been stripped of their bark can be pruned back. If the entire tree has suffered damage and pruning would remove everything, then your only option is to not prune, wait for Mother Nature to take its course and see what survives. Often, a plant will leaf out and bloom after rodent damage only to die later in the season. If your lawn was damaged by voles and this is normally indicated by tunneling marks, then you need to top dress the tunnels with some soil, reseed those bare areas and water. There was quite a bit of vole damage this year, especially in gardens adjacent to the countryside. My garden, adjacent to the downtown core, had no vole damage. There was also rabbit damage in some gardens, again, most of those gardens were located close to parks or the countryside. • The things I do for my readers #2: I have to put on a disguise, a hat and shades, and walk around chain stores, inspecting their garden centers just for the benefit of my readers. In short, my report says “you owe me big time for this one.” I have inspected, if I can use that word, Lowe’s, Rona, Home Depot (East), Super Store (East), and Wal-Mart (East). What I found, for the most part, makes me shake my head. At Super Store, I would estimate that one half of their plants were either dying or already dead, including their tall cedars. I found that there is a bit of a price war on ten inch hanging baskets, with some going as low as nine bucks, at Wal-Mart. I examined those hangers and if you really want a nine dollar hanging basket, give me a call and I will make up an order, just for you. Those nine dollar hangers are so poorly made that I calculated they had a cost of less than three dollars in them. That’s why I will take your orders. They are in a word, a ‘joke’, overpriced at nine bucks. If you want the good stuff, the hangers that are well grown and well looked after, then visit one of the independents I recommended in #143. At all of the chain garden centers, I found and observed first hand, that there are two types of employees. Those who put things on shelves and those who take your money. I could not fine an employee, nary a one, who was actually offering any type or form of service. At the independents, they will tell you to leave some of their plants alone because you either have too much shade or too much sun. 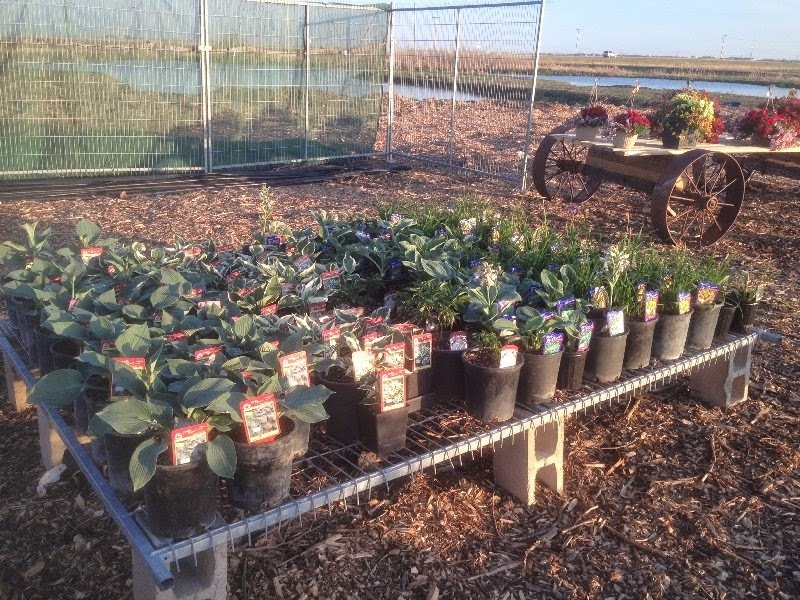 It is worth a growing season to have someone who knows something about plants, assisting the customers who shop there. • Is it too early to plant: Tough one. If you could dig out your crystal ball and tell me within one degree, how cold it will be at night for the next two weeks, then I could provide you with a better answer. Myself, I am not planting until this coming weekend. Similar to you, I am tempted to get out there on the first nice day that we have and to plant up a storm. I did that three years ago and within the week, my friend Greg Morley was over, running into my garage, all the pots and containers that I had planted, for safe keeping. Greg never complained, at least to me he didn’t, but I suspect that his wife heard me being described with Unchristian like words later that evening. • Cathedral Village Arts Festival: The street fair had another incredible turnout. It was smoking hot in the afternoon and the lines for cold lemonade were long. I know that the following statement shows my age, but has anyone else noticed that the line between fashion and lingerie has been blurred? If by chance, you are privileged to see me in my underwear, chances are I have made a terrible mistake and not a fashion choice. • An inner thought shared: I say that little things don’t bother me, but I lie, they do.